Visits: 41795 persons viewed this recipe. Dry red chilli chicken – another successful experiment with chicken. 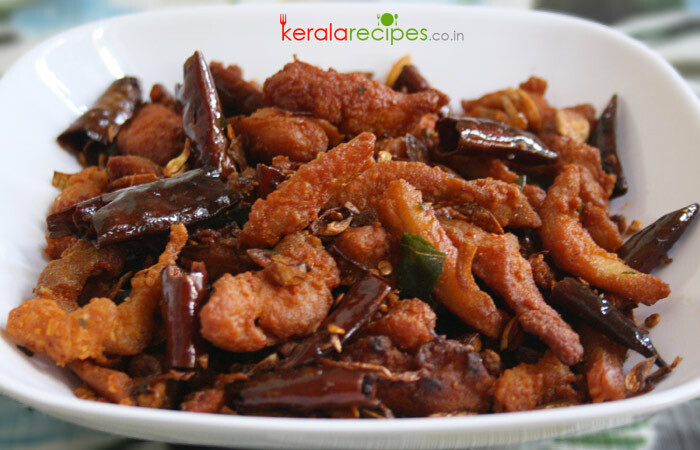 As its name says it is a variety chicken preparation with dry red chillies. It can be served as a starter or snack and also goes well with rice. Wash and clean the chicken. Cut it (length wise) into small pieces. Grind ginger (1 inch piece), garlic (5 cloves), curry leaves (1 sprig), lemon juice, salt , chilli powder (1 table spoon) and turmeric powder into a paste. Marinate chicken pieces the ground paste for minimum 30 minutes. Slice remaining garlic, ginger and shallots. Add gram/corn flour into the marinated chicken pieces and mix it well by adding 4 table spoon of water. Heat cooking oil in a pan and deep fry the chicken pieces (till it turns brown). Keep it aside. Heat 2 table spoon of oil in a pan. Put broken dry red chillies (reduce the flame) and stir till it turns dark brown. Put garlic, ginger, shallots, curry leaves and salt into it and saute till it turns golden brown. Put ¼ table spoon of chilli powder and mix it well. Now, add the fried chicken into it and combine well. I tried this as snack in thif ramzan, try some rice flour with corn flour to marinate, some jeera too. Its different and yummy. Hi Afeela, Thank you very much for the tip. I will try it next time. Once again thanks for the feedback. Hey Shan….. kashmeeri chilly powder is useful for this recipe… it gives more stylishness…. Hi Sumayya, Thanks for the comment. You can definitely use kashmiri chilli powder. You are welcome Sindhu, Happy to know that you and your kids enjoyed it. Thanks for the feedback. Thanks a lot for this recipe. I tried this my son just loved it. Till today I have prepared it almost 8 to 9 times but still my son is not satisfied. He ask me to prepare it again and again. When ever I ask him what to prepare in chicken he tills red chilli chicken. But I add all in one ching’s sauce for it try it its too good. Hi Shaan, your recipe very tasty. Thank u sir. I too have passion for cooking, daily I am searching new recipes. I learned a lot from you. Amal, Glad to know that you love cooking. Thank you very much for trying my recipes and also for the feedback. Wowww… nadan chilly chicken. Last night made for dinner. It was really yummy. Thank you Shaan. Post more simple recipes. Shibin, Great to know that this recipe came out well for you. I will try to post more simple dishes. Thanks a lot for the feedback.